It wasn’t pretty, but Enegan Affrico Firenze (5-7) grabbed an important win against Viola Reggio Calabria (4-8). With three games to play before the half-season mark, Firenze seems to have figured out how to defend without mental lapses or banal mistakes. The offense still suffer from what coach Caja described as “lack of confidence, maybe caused by the bad record”, but, overall, the will shown was enough to win the third straight game. Enegan lead from start to finish never being able to put a relevant margin between them and the opponents. Credits goes to the Reggio players who never stopped playing and fighting. But the home team never let their own offensive mistakes ruin the special night lived in Firenze: a tribut before tipoff was observed in honor of Nelson Mandela and an event that put together the two teams was held at the end. During post-game interviews head coach Attilio Caja analyzed the game and the difference between Affrico’s aggressive and focused defense and its blundering and mistake-prone offense. He praised the opponents and also had words for the coming games:”Reggio scored difficult baskets with our defense always spot on. They surprised me: they never gave up. Winning a game like this means much more than others. […] Three wins in a row are allowing us to see our progress first-hand; we can still improve, but wins build confidence”. Caja concluded with polite remarks to the officials:” When we’ll play away, I hope we will receive the same treat as Viola did. Just look at the free throws numbers. With respect to Viola’s players, who played strong and physically, I hope we will receive the same refereeing when we play away”. ENEGAN FIRENZE: Simoncelli 2 (0/2, 0/4), Wood 20 (7/11, 1/3), Swanston 9 (3/4, 1/2), Castelli 9 (3/6), Conti 10 (5/8); Rabaglietti 11 (2/4, 1/2), Cucco 4 (2/4, 0/3), Schiano 4 (2/4, 0/1), Severini, Pazzi DNP. All. : Caja. VIOLA REGGIO CALABRIA: Sabbatino 5 (1/2, 1/3), Bell (0/2, 0/1), Fabi 22 (4/6, 3/8), Hamilton 9 (2/7, 0/1), Ammannato 19 (8/10, 0/1); Sorrentino 3 (1/3, 1/2), Caprari 5 (1/3 from 3), Spera (0/2), Azzaro DNP, Lupusor DNP. All. : Ponticiello. OFFICIALS: Giovanrosa, Yang Yao e Radaelli . 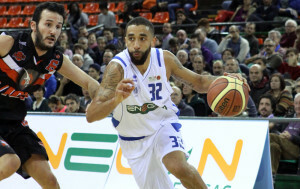 NOTES – FG Percentages: Firenze 24/43 from 2, 3/15 from 3; Reggio Calabria 15/32 from 2, 6/19 from 3. Free Throws: Firenze 12/15, Reggio Calabria 15/26. Rebounds: Firenze 31 (Swanston 9), Reggio Calabria 27 (Hamilton 8). Assist: Firenze 10 (Wood 4), Reggio Calabria 12 (Sorrentino 4). Turnovers-Steals: Firenze 15-9, Reggio Calabria 16-8. Fouled out : Swanston. Spectators 500.